Centre Fellow, Dr Andrew Knight has published a ground breaking work on the utilitarian ethics of animal experimentation. In The Costs and Benefits of Animal Experiments, bioethicist and veterinarian Andrew Knight presents more than a decade of ground-breaking scientific research, analysis and experience to provide evidence-based answers to a key question: is animal experimentation ethically justifiable? 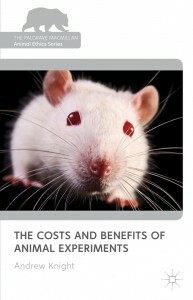 The Costs and Benefits of Animal Experiments is the most recent publication in the Palgrave Macmillan Series on Animal Ethics. The Series is produced in partnership with the Centre and aims to provide a range of key introductory and advanced texts that map out ethical positions on animal issues. More information about the book is here and the book can be ordered here.